HMUK’s commissioned research Can Music Make You Sick? showed that that those working in music were up to three times more likely to suffer from mental health issues compared to general public. The study was the largest research of its kind in the UK to date, with 2,211 people working in music taking part. Evidence shows that low income, unsocial hours, irregular employment, working away from home and continuous use of the body in repetitive activity can all take their toll on musicians. The creative satisfaction of being a musician or working in the music profession can be rewarding, but the connection between performance, identity and the need for self-belief can leave musicians vulnerable. After 12 months of planning and developing, HMUK were proud to launch Music Minds Matter in December 2017. Consistently in our research, respondents said they felt underserved by available help and that there were significant gaps in provision of services for musicians. As the leading charity for musicians, HMUK exists to give those working in music (and those around them) help and support. 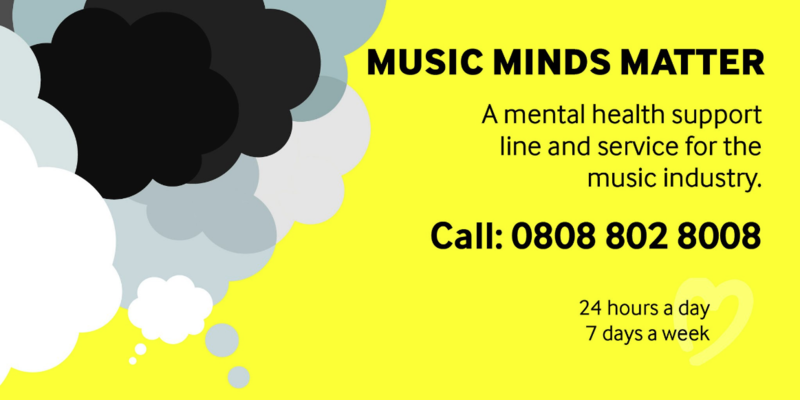 Music Minds Matter is the industry’s most comprehensive mental health service, and offers emotional support, advice and signposting to anyone who gets in touch. People may also be able to access telephone counselling, face-to-face counselling, and Cognitive Behavioural Therapy. There is even signposting to specialist services in areas such as addiction, homelessness, sexual harassment and more. The service is free and confidential to access. 24 hours a day, seven days a week. The 0808 802 8008 telephone number can be accessed 24/7 and the MMM@helpmusicians.org.uk email address will be checked regularly, with a response provided within 48 hours.